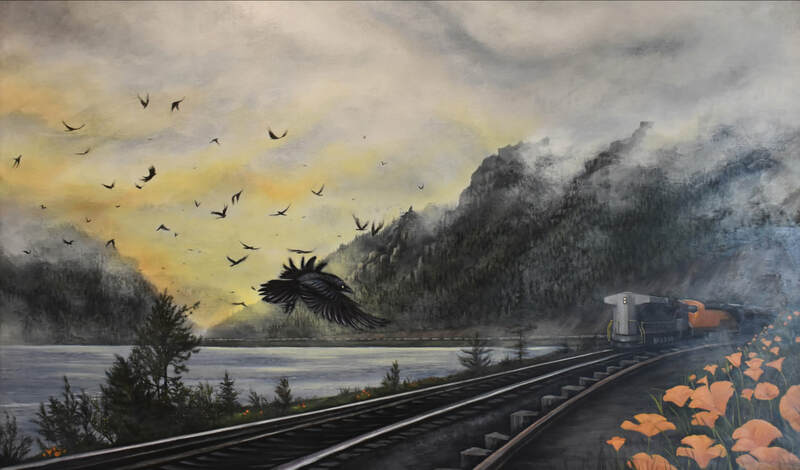 "Murder" Oil train, Columbia River Gorge, WA and OR (2017). Image courtesy of the artist. ​As an ecologist and evolutionary biologist whose primary job is to educate artists and designers, I am always looking to better illuminate the intersection between math/science and art/design. One way to understand this intersection is to seek out artists and designers whose work is influenced by a genuine engagement with science and the scientists who produce scientific scholarship. Ardis DeFreece is just such an artist, a painter and draftswoman whose work has explored how nature and human intervention intersect. Ardis is deeply curious about the natural world and our place in nature, and this interest is informed by working directly with scientists. 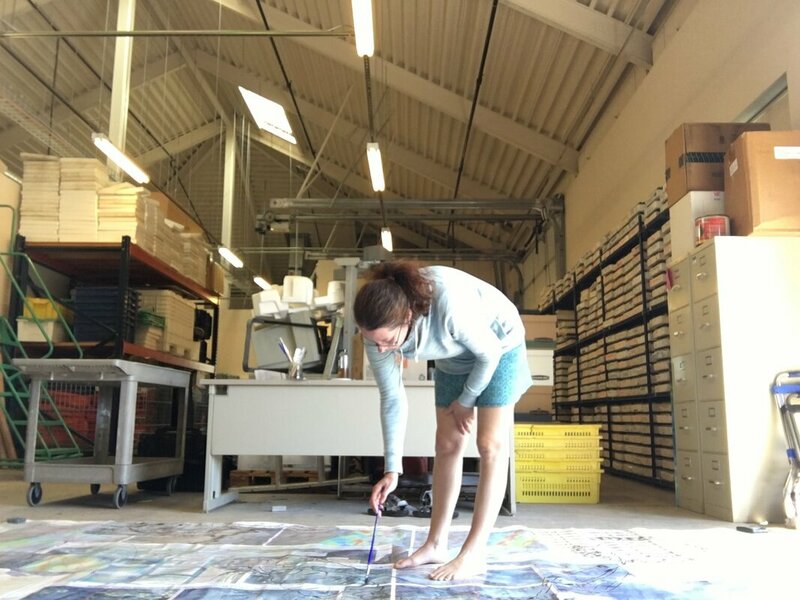 A professor teaching foundation art and painting/drawing at Pacific Northwest College of Art (PNCA), Ardis maintains active connections with the science community through PNCA’s Art-Science Initiative and via collaborations with scientists at several nearby field stations. After meeting her at the 2017 Ecological Society of America annual meeting, I decided to interview Ardis to better understand both her process and the resulting products of her engagement with science. I asked the questions that follow over email, which Ardis graciously answered while balancing her responsibilities as a studio artist, professor, and parent. Christopher X Jon Jensen: Introduce us to your art practice. How and when (and maybe why) did you start making art, and what kind of work are you making these days? Ardis DeFreece: I have been making art since I was a small child. One of my earliest memories is from when I must have been three or so, sitting on the kitchen floor coloring. Making art has always been a safe place for me and a source of energy. I can’t remember a time when my hands didn’t itch to make something. Even when there were periods of time when I didn’t create enough, the sense that I had to do something with my hands was always there. I am a restless person, both in action and in thoughts. As a chronic insomniac, art making has helped me to wrestle with my over-active mind and express ideas and feelings that were too difficult to articulate. Though it didn’t always help me sleep, the act of making and the release of creative energy helped me relax. Sometimes it has the opposite effect. In daylight hours art making can energize me like no caffeine ever could. I make art because it is the language I know best for communicating tangible and intangible ideas to the world and to myself. It is an integral part of who I am and how I see the world around me. As an educator, I know this is true for many others as well. It drives me to help others tap into the creative energy, intelligence, and skill to make art at any age. For me, painting and drawing have been my primary modes of expression. I also create experiential installations that are ecologically centered. My aim is to bring the viewer into the artwork and open dialogue around climate change and our relationship to the natural world. These days, I think a lot about how we humans separate ourselves from nature. Whether we consider nature to be a wild place, untouched by humans, or a construct that is touched by humans in every way, the connection to the non-human species of the world and ideas around this subject are key to my work. I also wrestle with different ways to use representation. Creating work from what I see around me and composing a compelling image and narrative are challenges I love. In each piece I research my subject, diagram and map the research, and come up with images that reflect my course of inquiry. This usually leads me to pull from my on-site experiences, photographs and field notes to create a composite image or installation that combines the research and collected imagery. At this point, I draw in charcoal on paper, birch panels, or canvas and move into paint, often beginning in acrylic and finishing with oil. I also work in mixed media over collage or on assembled pieces. The challenge is to know how much to include and what to leave out, what palette and media to choose, and how all of this might be seen by the viewer. In the end, I hope the work communicates beyond the visual and provokes the viewer to question what they know and feel about the world around us. 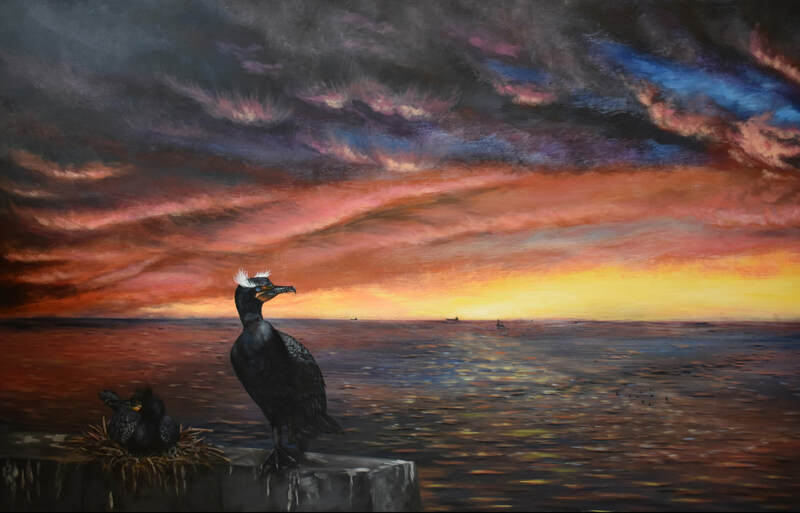 "Culling Cormorants" East Sand Island, Columbia River at the mouth (2017). Image courtesy of the artist. ​CXJJ: I am interested in how you deal with separation from nature in your own working process. The studio is often a space separated from nature, and I imagine that you spend a lot of time in your studio. How do you create the right amount of connection to nature in your own working process? AD: I deal with the separation from nature in a few different ways. The first is to draw as much inspiration as I can while in the field hiking, painting, drawing, researching, and exploring. I take notes and photographs and fill sketch books. This helps me to go back to the studio to expand on my ideas and experiences in my art making process. I use the notes, photographs, sketches, sound, and video recordings and my memories to create composite images for drawing and painting or for installations. The studio is a place where I can focus on these aspects of my experiences and ideas without the myriad distractions of the outside world. The work I make in the studio is contemplative for me, but as soon as I feel the need to reconnect with nature, I am back in it. Thankfully, I spend a great deal of time outdoors. It can be a difficult balance because of the time required in both places, but it is a wonderful problem to have! Currently, I am working with botanists at Metro’s Native Plant Restoration Center on the collection of seeds and propagation and preservation of native plants in the Portland area. 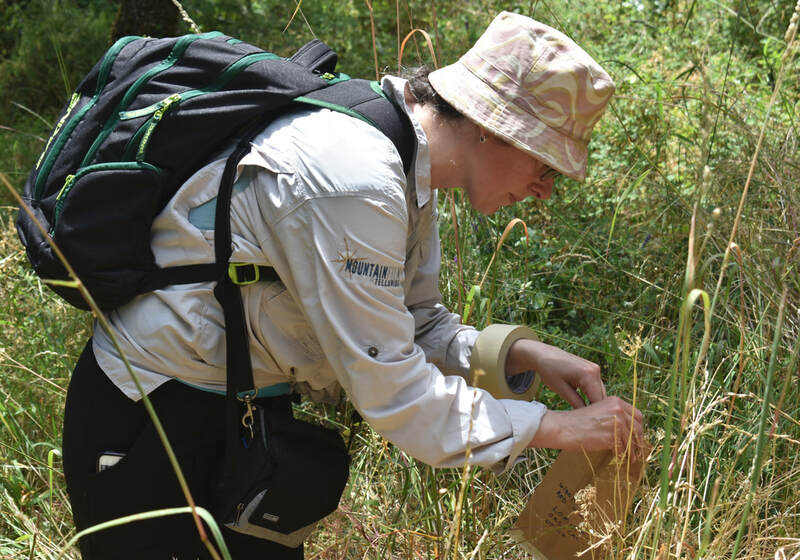 This project requires in-field research with the Seed Scout volunteers and botanists, lab research, archival research and studio time. I am squeezing this all in among teaching at Pacific Northwest College of Art (PNCA) and completing work for commissions and shows. Oh, and I am a mom. My favorite kind of organized chaos! 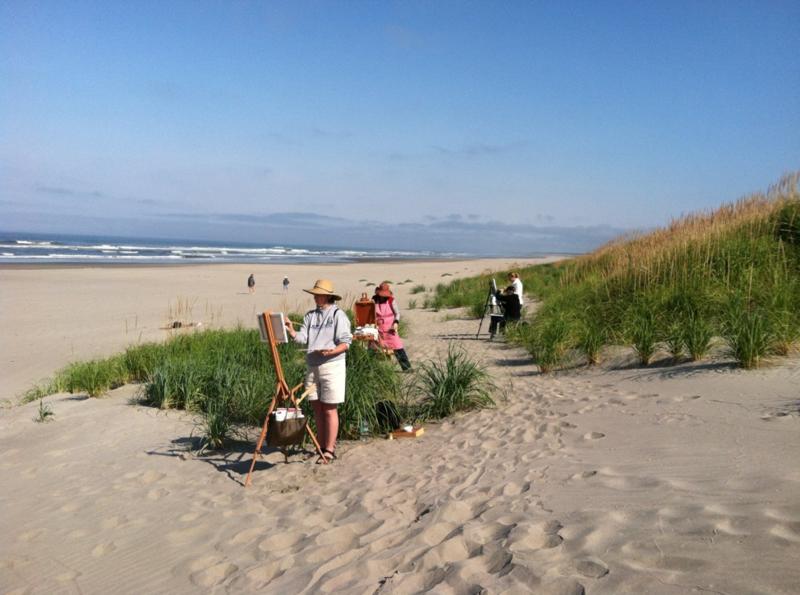 Ardis teaching painting workshops at the Oregon Coast. Photo courtesy of the artist. ​CXJJ: A lot of your more recent work incorporates scientific ideas, themes, and content. What led you to start engaging science as part of your creative process? AD: For many years I have had a strong interest in environmental issues, ideas about our relationship to nature, and a love of science, especially botany and ornithology. I also come from a family of artists who almost all eventually went into the sciences, primarily medicine. So it was never strange for me to combine my love of natural sciences and my art, however, I did not combine the disciplines deliberately until recently. For years I painted landscapes of threatened or ignored places without questioning why I kept doing it. I made elaborate still life paintings and drawings of things like birds nests, research tools, natural objects and piles of fast food as compared to piles of whole food... yet, I also continued to make pictures of sweeping vistas and tea pots that I knew would sell more easily. I have no problem with this, but I needed my work to say so much more. So, when I entered the MFA program at PNCA, I promised myself that the work I created would have a strong voice. As an assistant professor, it has been helpful to talk with students about their own artistic voices and help them along the journey to find what is meaningful to them. For many, at this stage of their lives as artists, it is so much about the exploration; and I encourage them to try it all and find what feels right for them. Not every artist needs to address big themes in their work, but for me, this became essential to take my work to another level. These days, in my process, I think constantly about the state of our planet and all the creatures on it. I am increasingly more interested in connecting to the non-human voices as a way to broaden the conversation and elicit empathy from my viewers. I am also looking to connect these species to their habitat. I do a lot of research in the field, as well as interviews, lab work, and a lot of reading on the environment, conditions, and history of each subject and I bring this into the studio. Each time I go through this process, before picking up a paintbrush or piece of charcoal, my head is full of ideas. It reminds me of the chief scientist I worked with at my residency with NOAA, the late Bill Peterson, who confirmed that in his own research he often cast a wide net. Then he could work with the information he gathered to find a pattern or more direct line of inquiry. It showed me how much scientists and artists actually work in very similar ways. In the end, the engagement of science in my work came down to curiosity and a genuine love of learning. The artists and scientists in my life have always been the most doggedly curious people I know, and it must have rubbed off on me. In addition, I want to explore the natural world in my work and share it with others. For me, this means attempting to understand Nature as much as I can, from its processes and systems, its creatures and life forms, it rocks and minerals and the part we humans play in our care for and damage to the natural world. Who better to learn from than others who are engaged in this exploration? As a side note, I have been fascinated by the chemistry of paint and art media since I was a kid. I have invested much study in the composition and history of pigments and other media. Experimenting with surface preparations, substrates, temperatures, thinners, oils, resins, and more has been an important part of my growth as an artist and educator. This might seem sort of obscure I guess, but the more I learned about the lore of color, the sources of materials, and the chemistry, the more interested I became. So, science has always been a part of my practice, now it just takes a more central role. Ardis working on Curiosity at the Hatfield Marine Science Center, 2016. Photo courtesy of the artist. CXJJ: You were artist-in-residence at the National Oceanographic & Atmospheric Administration’s Hatfield Marine Science Center. How did that residency come to be, and what was expected of you as resident? AD: While I was in the MFA in Visual Studies program at PNCA, I applied for the NOAA residency. It was a project begun by Emily Bosanquet (Assistant Professor, environmental science), founder of the Art & Science Initiative at PNCA. 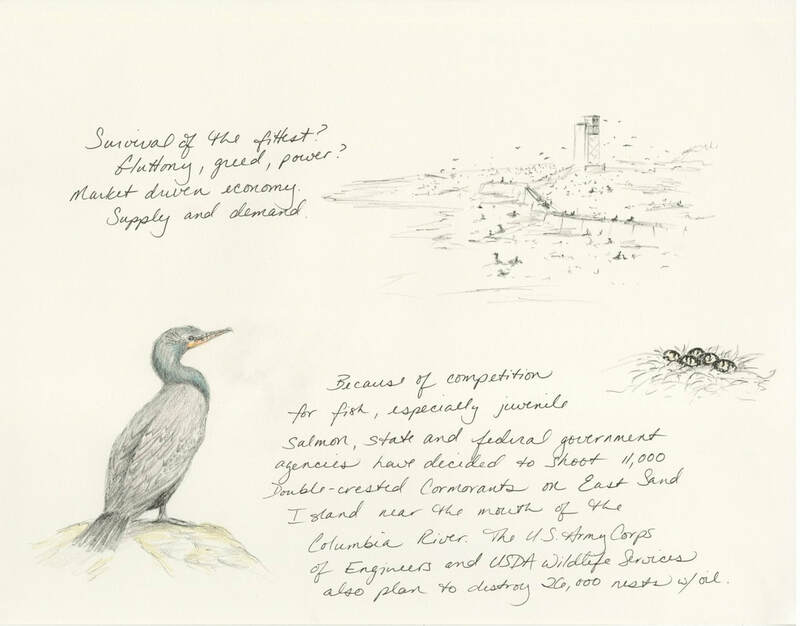 Her goal with the initiative was to put artists and scientists together to exchange ideas and to give artists the opportunity to make work in response to science, especially ecologically centered studies. The residency with NOAA looked like the perfect opportunity to embed myself with scientists in a practical working environment. For six weeks at Hatfield I would have the opportunity to observe and dialogue with incredible scientists, like Bill Peterson and his team, researching copepods and the wider food web. I was not given a clear directive for the outcome of the residency, only that I would have the facilities, materials and support to make and share my work in response to what I had learned. "Curiosity" Hatfield Marine Science Center, Newport, OR (2016). Photo courtesy of the artist. CXJJ: ​The work that emerged from your residency at Hatfield, Curiosity, combined a collage of scientific posters, a variety of different kinds of painting, and small collection boxes. How did your interaction with Hatfield scientists inspire this work? What did you learn by spending all this time with scientists that became a part of this work? AD: There are so many different things that I learned and more emerges for me all the time... First, I learned that artists and scientists often begin research in similar ways. When we start with a question or an idea, the inquiry does not usually progress in a truly linear way, but it is more rhizomatic. As I mentioned previously, in talking with Bill Peterson, the late marine scientist, he told me that in the beginning, he had to cast a wide net to collect information and look into different areas of research related to his hypothesis. I explained to him that this is exactly what many artists do. We explore many processes, subjects and ways of looking at an idea before we begin and during the entire process. We are curious. It is this curiosity in the arts and sciences that has inspired me most. So many things from my experiences and observations became part of the work. In talking with scientists working with copepods, phytoplankton, shore birds, sharks, turtles, and more, I learned about the intricate and important connections between all of nature's systems. I learned about the way the work begins with a question or idea, and the inquiry happens in the field (or on the boat), in the lab, in research and writing, and in the sharing of ideas. These observations and the science poster collage showed the wide variety of subject areas, presentation methods, and even the aesthetic. 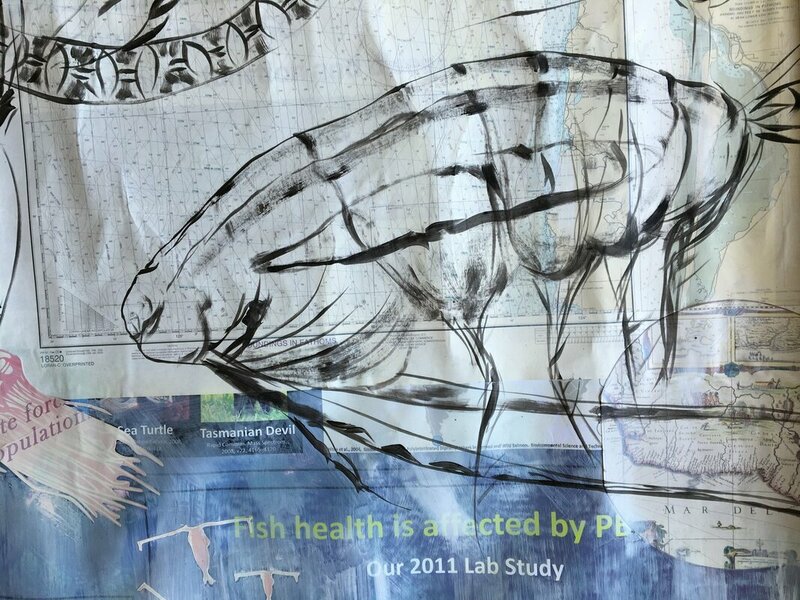 I painted enlarged copepods and phytoplankton on the collage to show the research as a foundation for sustaining a healthy ecosystem and to highlight the idea that it is often the tiniest creature that, in a multitude, can support an entire system. 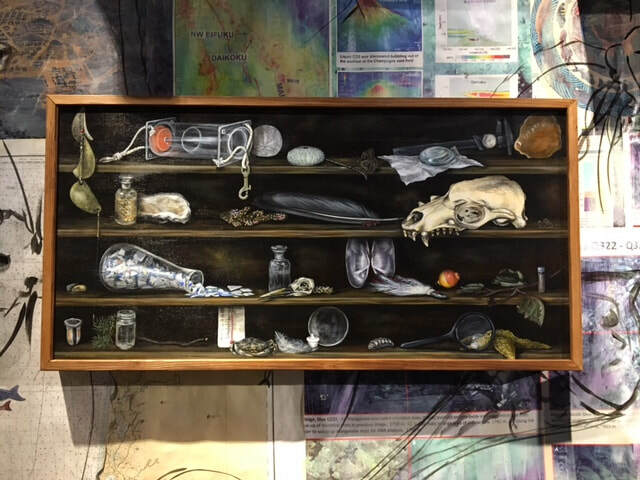 I used the "curiosity cabinets" to show specimens, tools, and the detritus that I found on the beach as well as collected objects that were given to me by many Hatfield folks. These items ranged from skulls of sea lions and birds, to magnifying glasses, to feathers, microplastics, and more. 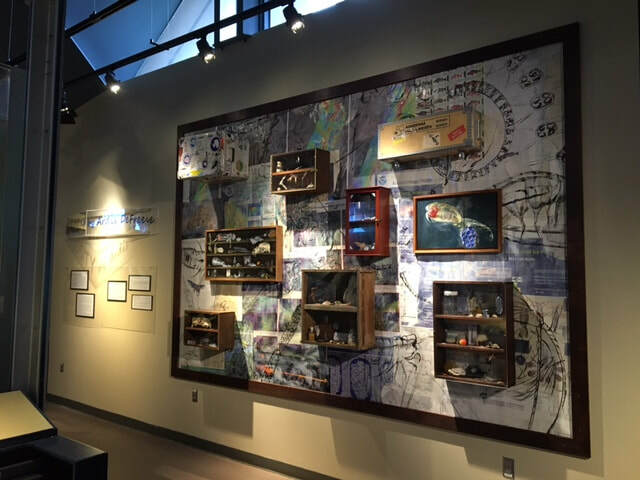 The cabinets were installed over the collage with paintings I created to play with the perception of what is seen as valuable or interesting. I have learned over the years that a painting is often far more valuable than the subject depicted, so I used this idea to elevate the small, unnoticed, or overlooked things in the lab, in nature, and in life. As a whole, I hope the installation conveys some of these ideas and shows the connection between art and science and the importance of curiosity. Detail from "Curiosity" Hatfield Marine Science Center, Newport, OR, (2016). Image courtesy of the artist. 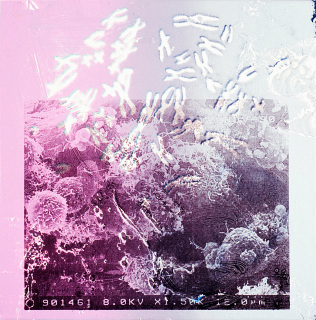 CXJJ: What are the challenges of being an artist-in-residence at a scientific institution? How did you balance your own artistic goals with the expectations of the scientists you worked with? AD: I think the biggest challenge was not having more time. I could have stayed there for a year, there was so much to learn. The scientists and administrators I worked with were welcoming and excited to have me there. They never made me feel out of place and when they did not understand the place of an artists at NOAA, I would explain my ideas and ask questions. Every time, they were excited and intrigued to see what I would come up with. Some of the scientists had the misconception that I was there to create infographics or artwork to use in promotional/informational materials. However, when I explained that as an artist-in-residence, my work would have more to do with an artistic inquiry into their work, they responded with enthusiasm. It was a pleasure to work with scientists and administrators from NOAA Fisheries, as well as Oregon State University while I was at Hatfield. I hope to continue with another project there in the future. ​CXJJ: Although there’s a big push for STEAM - the combination of STEM fields with various arts - it is often the case that this collaboration is asymmetrical. Art can be made to serve the purpose of scientific communication, or science can be used as a prop within a particular work of art. In your experience, what are some of the keys to creating a genuine, respectful, and perhaps egalitarian dialogue between art and science? AD: The push for STEAM in education at all levels today is encouraging, however, I too have seen the lack of balance in the subject areas. It seems that many educators struggle to build programs that are not just the Arts supported by Sciences or Sciences supported by the Arts. In my experience at this intersection, I have found the benefits of both the equal and unequal collaboration. At Hatfield, I was working within a group of scientists and observing, more from the outside. With my current project, I am working alongside botanists and researchers to identify plants, tramp through new discovery zones, and discuss the habitat, and conditions of each plant. The scientists have the chance to ask me questions about my project, sketches, and inquiry. They suggest other plants or issues related to my line of inquiry and assist me in forming the project as a whole. Though they may not design the physical aspects of the artwork, their influence will be seen throughout. It is difficult at certain stages to carry the collaboration equally on all sides, and I think, a bit unrealistic, though I am not sure that degrades the importance of the collaboration. In my experience, in many collaborative projects, each member has various strengths and weaknesses. There will always be someone with a stronger skill set here, or more knowledge there. To me, the key is to share this with the group and not to feel anything is taken away when the process seesaws a bit. It is all part of the process. As an artist, I know that I see the world in a different way and that my scientist colleagues appreciate this. In turn, the same is true for me when I am working with them. I have learned new ways of researching, exploring, and thinking critically about a particular problem or issue. Currently, I am working on a collaborative writing piece with artist, author, and activist Brian Holmes. He said that he is particularly, "interested in the connections of things." This is true for me as well. In the collaborative process, mutual respect, curiosity and an open mind are key to the success of any project. Field notes from "The Sinister Sublime, An Artistic and Environmental Exploration of the Columbia River" (2017). Image courtesy of the artist. CXJJ: Does your passion for science find its way into your art teaching? AD: My passion for science finds its way into my teaching every day. Whether I am advising a student who is working at the intersection of art and science, or teaching a drawing class, the ways of thinking and working always come up. I have also found new ways to relate to wider groups of students through my scientific explorations. At PNCA, there are students from all over the world. We have discussed their ideas and concerns about climate change, technology, and the ever-quickening pace of life. In drawing, one of the first things I discuss with my students is the need to see in a new way. Sometimes this concept is confusing at first, but through projects and discussions, it takes shape and they do learn to see the world around them in new ways all the time. I feel most successful as a teacher when these "light bulb" moments occur. For me, this is the key to the art/science movement, if I can call it that. It is a desire to learn from each other so that we can innovate together in ways known and unknown. Ardis working in the field at Metro's Native Plant Restoration Center. Photo credit: François Raynal, Seed Scout Volunteer. ​CXJJ: Where I teach science (Pratt Institute), we are establishig a residency program for artists and designers to work with both our scientific faculty and faculty in our art and design programs. Any advice on how to set up that interaction to maximize “discoveries” at the interface between art/design and math/science? AD: In order for a residency with artists and scientists to work well, there are a few key factors to consider. First, will you be pairing up the artists and scientists or will they bring a project to you? If you are offering the chance for artists to apply to collaborate with scientists working in any particular field, this can work well. At Hatfield and Metro, I knew a bit about the work they were doing and the subject areas. It helped me to engage my interest early on, before taking on the projects. I have seen artists struggle to shoe-horn their work into something the scientists could relate to, this did not work at all. It is important that there is a good fit from the start and a clear understanding of the goals and expectations for any project, if a tangible outcome is desired. The most successful collaborations I have seen have come from teams that enjoyed working together and learning from each other. What kind of tools, materials, and space will be provided? Because these projects can go in unexpected directions, it is important to have the facilities available to run with an idea if possible!